Home Columnists The role of the SENCO: what do you need to know? The SENCO has a critical role to play in ensuring that children with special educational needs and disabilities within a school receive the support they need. Gradually over the years the status and import of the role has developed with successive guidance validating and substantiating the role. In the most recent Code of Practice, the SENCO must be a qualified teacher (why ever were they not!) and a newly appointed SENCO must achieve a National award in Special Educational Needs Coordination within three years of appointment. 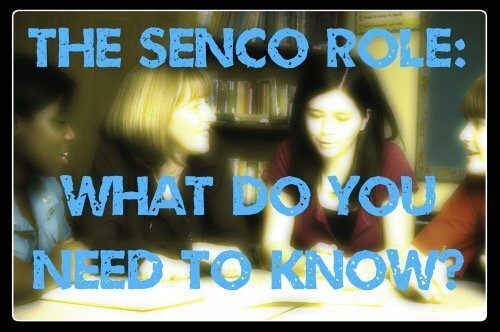 The SENCO has ‘an important role to play with the headteacher and governing body in determining the strategic development of SEN policy and provision and will be most effective if they are part of the school leadership team’. Clearly the role of the SENCO as a leader in a school has never been more important. First of all the SENCO needs to have status in the school. As we all know status is a combination of your role/position and credibility. The position of the SENCO does not necessarily hold great status in some schools even though on average nearly a fifth of children in the school are likely to have some kind of special educational need. If the SENCO is not a member of the leadership team it makes their job harder. With status comes the capacity and authority to make change where it is needed so it follows that they are less likely to bring about effective change in the school if they are not on the team. However, not having the SENCO on the leadership team also says something about the school’s attitude to inclusion and how high a priority the status of SEND is on the agenda. Unless the SENCO works closely with the Headteacher and the Headteacher both recognises and supports the critical strategic leadership role of the SENCO the provision will not be as good as it could be. The SEN action plan should not be an afterthought or an add-on – it should clearly link with whole-school priorities. Secondly, the SENCO needs to have time to carry out their duties. The Code of Practice states the SENCO should have ‘sufficient time and resources to carry out these functions’. It’s hard to be precise about the amount of time a SENCO will need to carry out their duties as every school is different. There will be varying numbers of children identified as having SEN. What is clear is that anything less than a working day each week in any school setting would seem too little for the role to be carried out effectively. In most cases much more time is needed. · Is the SENCO a member of the Senior Leadership Team? · Does the SENCO regularly inform SLT on current SEND policy and practice? · Does the SENCO have a clear vision for SEN provision and outcomes in the Academy? · Does the SEN Information Report meet legal requirements and is it published on the Academy website? · Has the SENCO received appropriate training and is knowledgeable on policy and practice? · As part of the School Improvement Plan is there a SEN development plan in place with clear aims and objectives? · Is the SENCO involved in making decisions about staff deployment and use of resources for SEN (including funding and the use of pupil premium)? · Has a lead governor for SEN been identified and are they briefed regularly by the SENCO? · Does the lead SEN governor systematically challenge leaders about the learning and progress of pupils with SEN and the efficient use of resources? · Is SEN provision (including roles of staff) clearly articulated and understood by all? · Are staff CPD needs in regard to SEN being accurately identified; is relevant and ongoing training put in place (including for Teaching Assistants and support staff)? Many of my colleagues have found this a helpful way of overviewing the provision and asking themselves the question, ‘What is the service for each of these areas of SEN in our school?’ and ‘Where is our school-based expertise in these four areas?’. What should I expect from my SENCO? You should expect honesty and a commitment to working in partnership with you to provide the best service possible for your child. You should expect the SENCO to ensure that any plans or provision agreed for your child are carried out by the school. What questions should I ask my school? What expertise is there in the school to support my child? What support is or will be in place, which is additional to or different from what children without SEN are receiving? Is the support working? – ie. is my child happy in school and making good progress? It is important that you receive honest answers to these questions because honesty, even if it’s not always exactly what you might want to hear, will build your confidence and trust in the school. How will the SENCO support my child and me? They should ensure that you are well-informed about the provision for your child and that you are invited to regular review meetings where you can discuss how things are going. In school they should advocate for your child by understanding his or her needs and ensuring that everyone who regularly works with your child knows how best to support them. What qualities should I look for in a SENCO? An understanding and empathy for children with SEN.
A commitment to improving the service. If I don't feel a SENCO is appropriately supporting my child what should I do? The first thing to do is to meet with the SENCO, set out your views and secure their commitment to improve things. If that doesn’t work you should write a letter to the Headteacher explaining your concerns and ask to meet with them. If that doesn’t work you should ask to meet with the lead governor for SEN in the school (since September 2014 every school has had to have one). If that doesn’t work then you should contact the local authority or appropriate body in charge of the school (for example in the case of an academy the academy trust’s board). If that doesn’t work you should contact your local MP with your concerns. At any point in this process you might like to take advice from one of the many parent organisations set up around the country to support parents of children with SEN or a national organisation which focuses on your child’s particular needs. You might also take advice and support from an organisation like IPSEA (Independent Parental Special Education Advice). Where can I go for more info on the role of SENCO and school requirements? Chapter 6 of the SEN Code of Practice sets out the responsibilities of schools and on p.108 the role of the SENCO is set out.